Megan and I are about to go see the movie "Australia" at the dollar theater.I had the fortune of spending about 3 months in this wonderful country, exactly 10 years ago from right now. 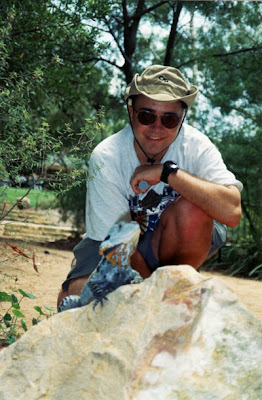 Here's a shot taken by my buddy Bryan at a botanical garden in Canberra that was crawling with Australian water dragons. Hard to believe it has been that long. I'm almost 30, my birthday is Monday. My Australian birthday was particularly cool for one reason- it occurred in the summer. We had a water balloon fight-you can't do that in February in the northern hemisphere! My mom's birthday is also February 16th, and my my maternal grandfather's 89th birthday is today. With 13 days and counting to our due date, will all the birthdays this weekend compel our baby to be born early!? That's what I've always said, too! Special people are born in the smallest month! Presidents Lincoln, Washington, my dad , myself, and what a wonderful surprise to have my son,Tom, born on my birthday, and the tradition of Feb. birthdays goes on... or does it? It may be a March one, only the baby knows for sure! Whenever he or she comes, we'll celebrate, for sure! Wow, you have been to Australia also! So many great adventures! Swamp- Yes, we definitely are. I enjoyed your race post today! Mom- Yep. March will be cool too. Megan wants the baby to be born ASAP. She's getting tired of it kicking her! Lana- That is really neat, what a coincidence. Does everybody know each other? Tom- Australia the country and the movie were both pretty cool. I'm going to be scanning some of my images from that trip 10 years ago and showing them here. I also went to Borneo in 2001- That trip was cut short though, unfortunately, because I had a reaction to my anti-malarial meds. Hey Tom, so glad I stopped by your page today to have a look...yes, it's hard to believe that 10 years ago (!) we were running around in sandals and big hats in the Australian sun...I can definitely say that that trip opened up my eyes to just how big the world is. A moving realization for a small town Ohio boy like me. Cheers, mate!